The federal Patient Protection and Affordable Care Act (HR 3590) commonly referred to as the Affordable Care Act (ACA) or “Obamacare” was passed and signed into law on March 23, 2010. (Wikipedia) You might ask the question “What does Obamacare have to do with a plastic bag ban?” A lot more than you think! The similarity of characteristics between Obamacare and plastic bag bans is striking in many areas. A Plastic Bag Ban, like Obamacare, is a product of progressives who implement big government, top down, totalitarian solutions in response to real or imagined problems. To see what Obamacare and Plastic Bag Bans have in common, read on! 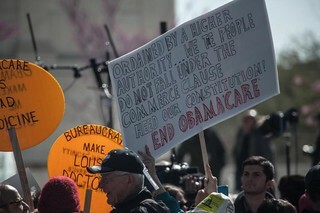 Obamacare was passed on a single party line vote and signed into law despite the overwhelming opposition by the public. (Williams, 2014) Likewise, plastic bag bans are passed into law by progressive city councils or county board of supervisors even though more than 50% of the public is opposed. In other words, like Obamacare, plastic bag bans are forced down the throats of the public whether you like it or not. Obamacare prevents health insurance companies from selling insurance policies that do not meet federal coverage standards. Likewise, state and local bag ban ordinances prevent retail stores from distributing plastic carryout bags that do not meet reusable bag standards and are at least 225 mils thick. I’ll bet they spend lots of time wondering how they can FUSS with us in the future.